2014, photo courtesy Jean Cavanaugh.I came across the Kusko project completed by Kiley in 1996, in TCLF’s online and traveling exhibition Landslide 2013: The Landscape Architecture Legacy of Dan Kiley. The recently commissioned images revealed a compact, exciting modern house set in a forested hillside, with valleys carved by seasonal streams. It struck me as unique among Kiley’s residential work. It was not suburban, or a historic farmstead with orchards, or a lavish spread. The design program for the weekend retreat was simple: be in the woods. I volunteered to document the site for a Historic American Landscapes Survey (HALS) short form. As a member of the Boston Society of Landscape Architect’s HALS committee, I was searching for Modernist designed landscapes in Massachusetts that might be good candidates for inclusion in this important historic resource database. The Boston Society of Landscape Architect’s HALS committee was supporting a drive launched by the American Society of Landscape Architects (ASLA) to get more sites added to the database, encouraging involvement from ASLA chapters across the country. Preparation of a HALS standard form historical report requires more research and writing than for a short form. Additional HALS documentation may include creating detailed measured and/or interpretive drawings and/or large format photography using a view camera. Full HALS documentation of a landscape typically require the collaboration of a team of landscape architects, historians and professional photographers and is often undertaken by the National Park Service HALS office, by college professors and their students, or by professionals paid to prepare mitigation documentation. The short form that I was utilizing was developed to encourage people to more easily make contributions to the database, especially for less known or threatened sites. It requires a brief statement of significance, a description of the property with an assessment of its current condition relative to the original, and a historic narrative. Plans and images are optional – non-professional photography is acceptable. All types of landscapes are qualified – vernacular, urban, designed, ethnographic, etc. Whitman; (lower) Entry wall, 2014, photo courtesy Jean Cavanaugh.Developing a HALS short form presented me with a wonderful opportunity to visit a residential landscape designed by Kiley, talk with the original client, and understand for myself what elements of Kiley’s design made the space effective. I had no trouble convincing Jean Cavanaugh, a friend and landscape architect to travel to Williamstown with me and spend a weekend exploring Kusko’s property, studying the landscape at different times of day and sharing observations and analysis. Her images contribute substantially to the submission. Arriving at the property, visitors emerge from a dark entrance tunnel of closely planted hemlocks to see an expansive view of the terrain. 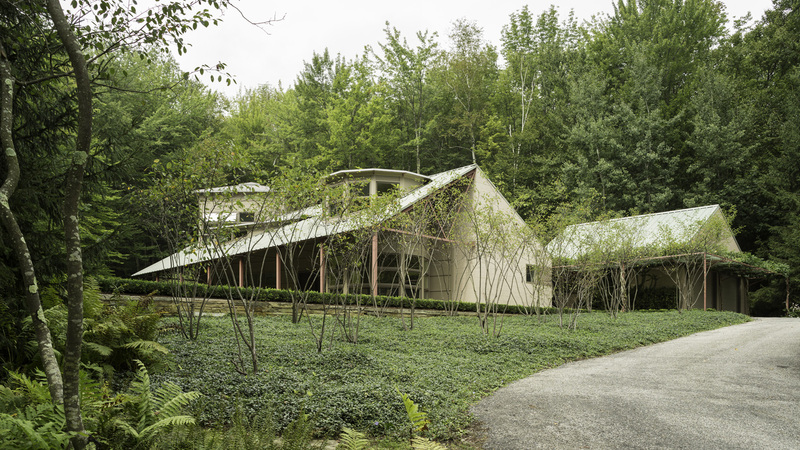 The woods on either side of the road leading up to the house are heavily cleared, so glimpsing the house, the design of which was inspired by the long, low riparian mill sheds of the Berkshire’s industrial past, is secondary to feeling the impact of the terrain. A groundcover of native ferns cover the hillsides and valleys, providing an uninterrupted experience of the topography, much like a sweep of meadow grass or wheat amplifies a gently rolling hill. Groups of shadblow, pruned up to reveal spindly stems, lightly populate the ferns, as well as some carefully selected mature birches and shrubs. A group of stately firs mark the turn of the drive. Once around the bend, a low retaining wall appears against a hill covered in vinca, and more shadblow. The wall runs along the house and intersects with an arrival court, a garage and entry pergola, all designed by Kiley. This dignified architectural annex anchors the house into the hillside behind it. Approaching the house, the retaining wall, accentuated with short clipped evergreens and stepping pavers, takes your eye back out into the woods, where an elegant reflecting pool undulates among trees at the bottom of a slope reached by descending a series of terraced grass steps, perpendicular to the wall. The wall is the single organizing element, providing a simple but formal connection between the landscape of the house and the ‘wilderness’ all around it. fall, 2014, photos courtesy Peter Morrow Meyer. All the woodland visible from the house has been cleared of understory. At close range to the house, the trees have been selectively edited, with ample space to view them individually. The canopy is not dense, so sunlight filters in all day, alternately shadowing and highlighting the underplanted ferns. The woods gradually grow denser farther away from the house. The woodland has been architecturally defined, accentuated by the uniform fern carpet.